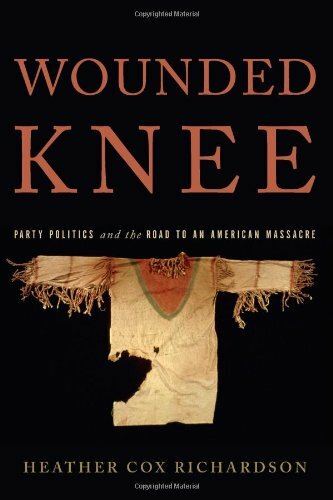 Wounded Knee has come to symbolize the vilest aspects of the treatment of American Indians by the United States government. The massacre of over 300 innocent men, women and children by U.S. troops in 1890 has become an iconic event in the troubling history of the indigenous people of America. The events surrounding Wounded Knee have long been known. What has remained unclear up to now is why President Harrison sent a full third of the U.S. Army to put down an “uprising” that had taken no lives and threatened no property. Heather Cox Richardson has done an admirable job in not only describing the local events leading up to the massacre, but more importantly, the larger national political scenario that impacted events on the ground. She makes a persuasive case that the road to the massacre began in Washington and was sealed by politicians thousands of miles away. When you add in a corrupt Bureau of Indian Affairs, a bored press corps sensationalizing news events, and poorly trained and insensitive young cavalry soldiers - the end result is not so surprising. Richardson’s thesis is that the overarching concerns of President William Henry Harrison with the outcome of the 1892 presidential election and the potential loss of Republican house and senate seats, led to governmental actions that created an atmosphere where atrocities were not out of the question. When Indian agents became very concerned with the Ghost Dance movement being adopted by many Sioux as a cult-like religious movement that would supposedly bring back the glory days of the tribe, the writing was clearly on the wall. Cox starts with an in depth history of the Dakota territory and its rapid growth due to the development of barbed wire, the discovery that the Great Plains could support an agricultural economy and the Republican Economic Plan that included western expansion. Despite the Treaty of 1868 that reserved much of Dakota for the tribes, by 1875 intruders had pushed the government to declare war on the Sioux. Even though Custer’s troops were annihilated in 1876 at the Little Big Horn, General Crook would quickly defeat the Sioux who either gave up or escaped to Canada. By 1878 the great Dakota land rush was on. The lead up to the massacre included the rationing of food promised to the reservation Indians whose way of life had been destroyed by the reservation system, a group of insensitive and corrupt Indian agents who were political appointees, and a Republican political plan to add western territories as states as fast as humanly possible to keep their party in power in difficult times. A sub theme that flows throughout the story is the underlying struggle between politicians and the military over control of the army and thus Indian affairs. In addition, the army was quite sensitive to the administration’s newly found interest in naval expansion to the detriment of the army. Thus the army had a lot to prove. Cox paints indelible portraits of key figures in this tragic tale- John Sherman, Senator from Ohio and architect of the Republican economic plan; William Tecumseh Sherman, brother of John, Civil War hero and in charge of Indian affairs for the Harrison administration; General Nelson Miles, a thoughtful, knowledgeable military leader who attempted but failed to defuse the growing tensions on and near the Indian reservations; Sitting Bull, one of the venerated Sioux chiefs whose killing during an arrest days before Wounded Knee would presage this climatic event. Whether Cox has proved beyond a shadow of a doubt that Washington politicians made the Wounded Knee Massacre an inevitability or not, she has painted an important and fascinating history showing that this tragedy certainly had roots that spread over many miles and many years far beyond the dusty plain near Wounded Knee Creek on a sunny day in 1890.